Here’s the latest update for the new tallest-building contender in the US: Nordstrom Tower, the superskinny supertall under construction in Midtown Manhattan, apparently no longer aspires to have the tallest spire in the US. But it just increased its roof height, meaning it will now tower above the current-tallest roof on the Willis Tower. 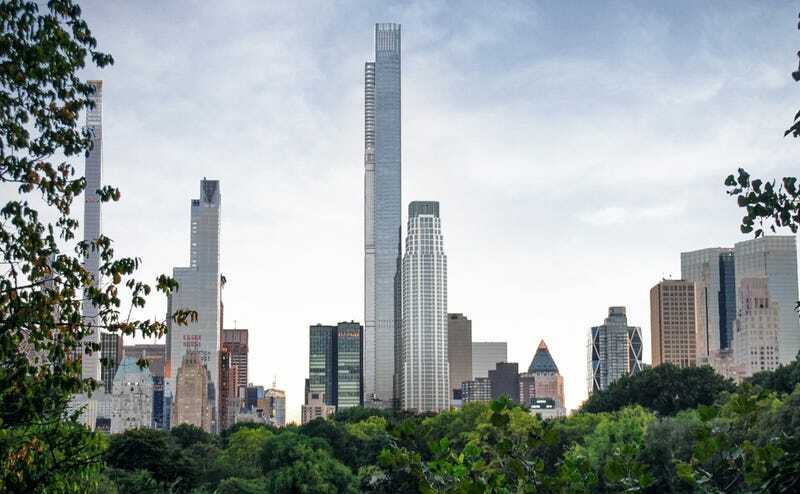 According to New York Yimby, the newest plans for the Nordstrom Tower reveal a roof height of 1,550 feet which will easily make it the tallest roof in the Western Hemisphere. That’s about 25 feet higher than reports earlier this summer and it means that the Nordstrom Tower will for sure definitely no question be the tallest. The roof height of the Willis (RIP Sears) Tower is 1,450 feet. But the big news this time around is that the Nordstrom Tower has shed any additional sky-piercing protrusions. The last Nordstrom Tower update showed it had not only boosted its height but also added a spire which was planned to reached 1,775 feet—or maybe even 1,776 feet, making it taller than the spire of recently opened 1 WTC (the WTC’s roof height is only 1,368 feet). Now the spire is gone, meaning that 1 WTC’s claim to be the tallest-including-spire in the Western Hemisphere is safe, at least for the moment. Over at NY Yimby editor Nikolai Fedak muses about the possibility that this was simply a case of value-engineering—the architects and developers realized it wasn’t worth the extra feet. But that doesn’t mean they can’t add one at the last minute, though. And knowing the way these things have worked in the past, they very well might.